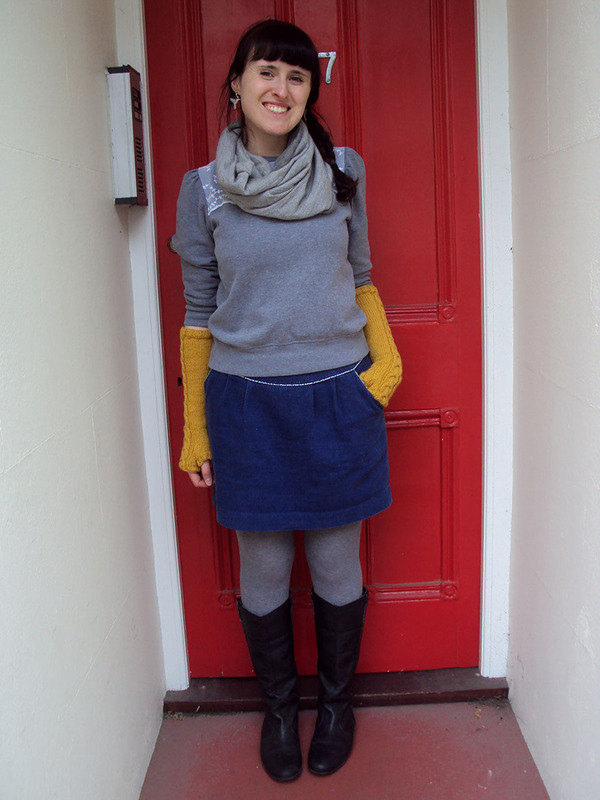 Yes it's warm enough to only need two (me-made) garments! How lovely does the sea look in the sunshine?! I really love this dress, it's so much fun to wear (or it will be once I adjust the right strap so it stops falling down). 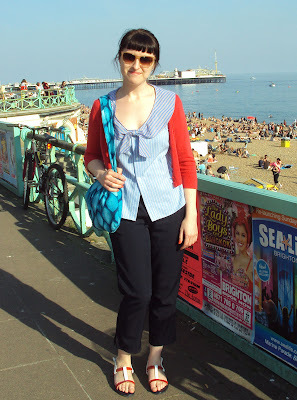 More lovely sunny seaside backdrop action for you. You're welcome. 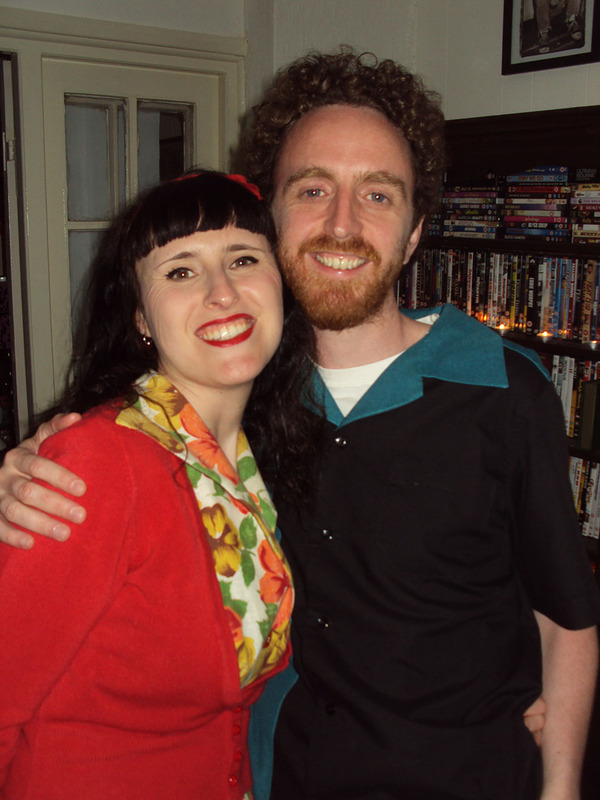 Patty and I went to a 30th birthday party which entailed dressing up in styles from our favourite 20th century decade. I'm sure you can guess we chose the 1950s. Much fun ensued. Soooooo hungover. However, the sandals are really performing well, like the proper shoes they are! This skirt is so frustrating when I'm walking along. 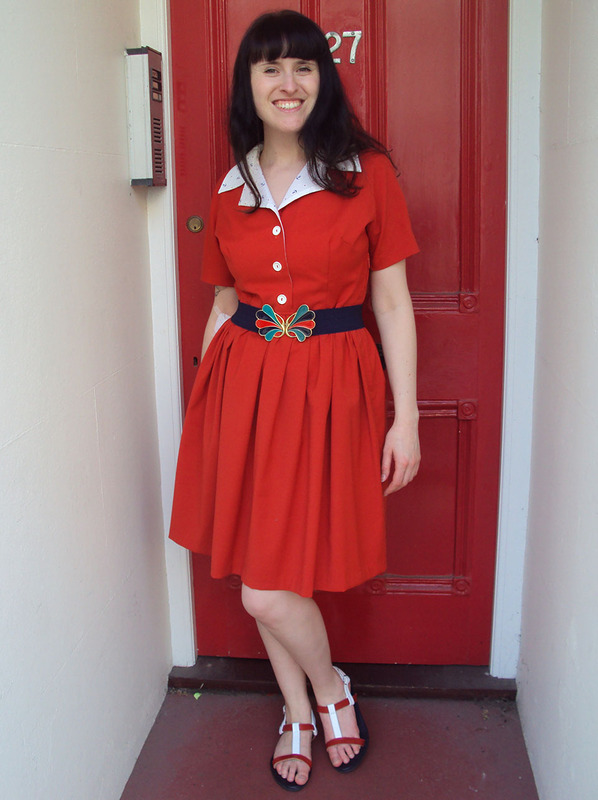 Because it's lined in shiny poly taffeta, it works its way around so the back is at the side or front! I have to anchor it down by putting my hand in the pocket! 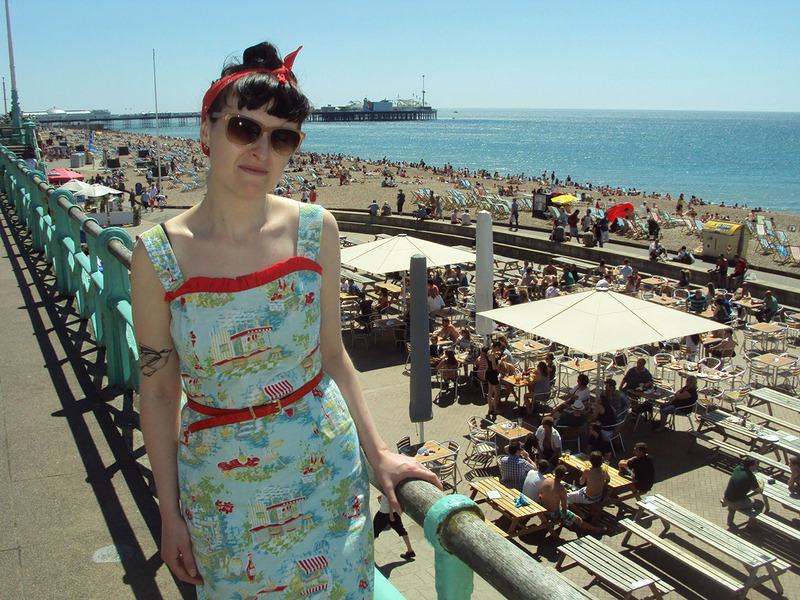 Summer Brighton Craftaganza Celebration Giveaway!!!! 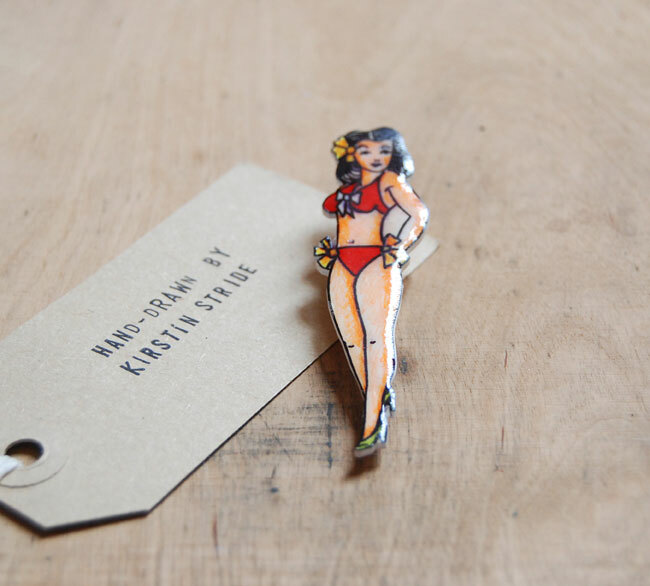 When I'm not sewing, blogging, working, eating flapjacks or drinking too much wine, I may be found organising a craft market called Brighton Craftaganza. There are three of these events a year held in my adopted city of Brighton, East Sussex, UK. 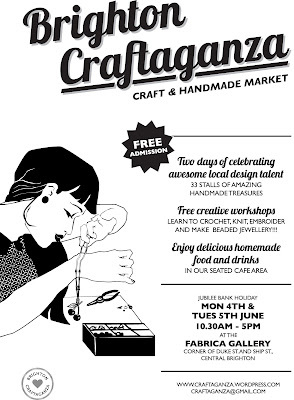 Next weekend in UK is an extra long bank holiday to celebrate the Queen's jubilee, but more importantly the Summer Brighton Craftaganza will be taking place on the Monday AND Tuesday, so head down if you can at all! There are going to be heaps of phenomenal local designer-makers selling their work, as well some free crafty workshops to spread the joy of making stuff. There'll be food and drinks available and a cafe area to enjoy them in. Basically, it's going to be epic. Now, I am fully aware that the vast majority of the visitors to my blog are not able to come along to the event itself no matter how much I beg due to simple geographical restrictions, so I've found another way to celebrate the event here on my blog: a giveaway!!! As I've mentioned before, the Brighton Craftaganza crew has undergone a fair few shifts in it's year and a half-long life. It begun with myself, Lisa and Steph. Then Lisa had to drop out after our first event due to having a bun in the oven and another book to write. Then Steph dropped out after our second event due to too much on her plate. Then I organised the third event almost entirely on my own, which nearly killed me. On the run up to this fourth event, I have a solid crew of awesome creative people taking on various tasks which has been absolutely wonderful and an infinitely more enjoyable experience. Currently, the Brighton Craftaganza crew consists of myself, Kirstin, Sarah and Kathryn, with a very generous helping of support from Rehanon and Patty (amount others). Kirstin is a creative force to be reckoned with. A craft fair organising veteran herself, her fair morphed into the much loved 'Handmade Co-op' shop which sadly closed earlier this year. Whilst the 'Handmade' brand is having a dormant phase she is busying herself making fantastic badges and necklaces from special shrinking plastic, having successfully tried her hand at all manner of creative expressions previously. Currently her two ranges inspired by antique books on birds and old school tattoos are available on her website and her Etsy shop. Kirstin is offering a 'Betty' pin-up badge in this giveaway pictured above and below. 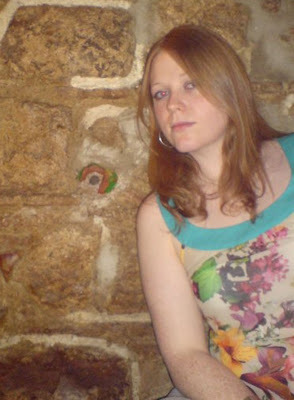 Sarah's crafty business is called Rock Cakes (check out her blog and Etsy shop) through which she sells a huge range of wonderful, whimsical jewellery. 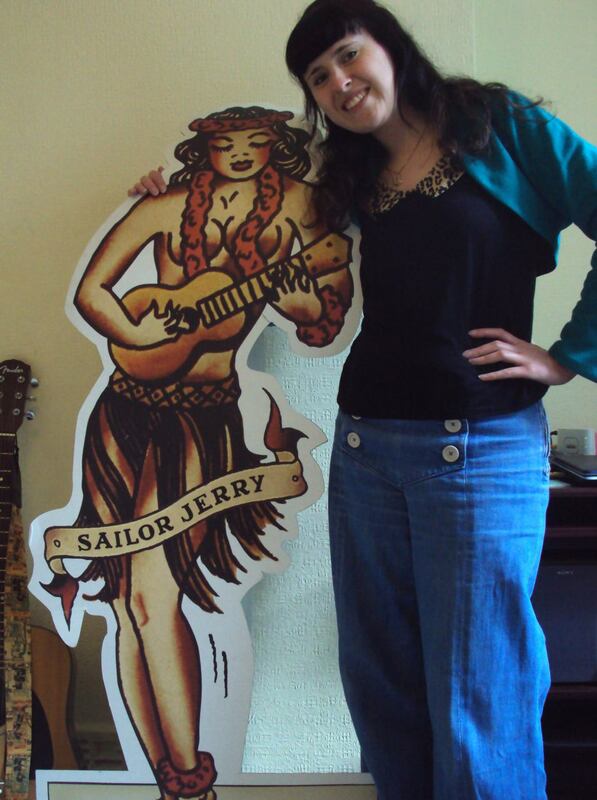 This is the lady who made my very special engagement ring. She is offering a fantastic laser cut acrylic 'Hello' necklace in silver mirror with silver coloured chain (pictured below). These are hugely popular round these parts, and you too could be sporting a friendly message without having to open your mouth! 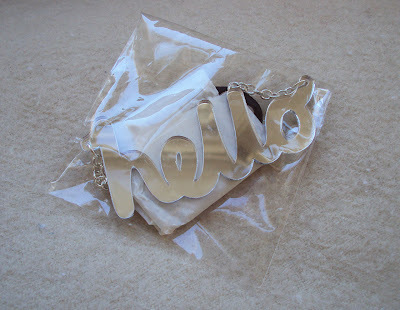 The winner will receive BOTH the 'Betty' badge by Kirstin Stride and 'Hello' necklace by Rock Cakes. This giveaway is open to anyone, wherever you live, and will cost the winner absolutely nothing to receive them. The winner will be selected by random number generator after the closing date and then emailed to get their postal address. To enter, leave a comment with your name and someway to get in touch with you (so either your email address or a link to a blog/site where your email address is VERY easy to find), plus tell me what you would wear these items with if you won them. The last bit is because I'm nosey, your response won't effect your chance of winning in anyway! The giveaway will close at the end of the event it is designed to celebrate (the Summer Brighton Craftaganza, remember?!) which is Tuesday 5th June, 5pm GMT. Good luck!!! We are getting close to the end of another awesome me-made/self-stitched month. Thankfully this week the sun has come out to play so I can rock some of my warmer weather gear, and step y'all from yawning over seeing my denim sailor trousers again and again! 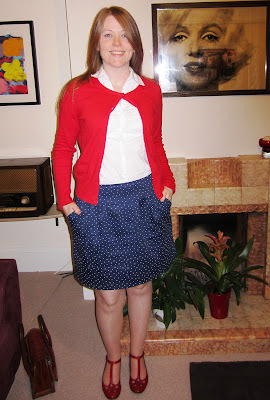 On this day I was filmed sewing for an English language video being made by Oxford University Press. 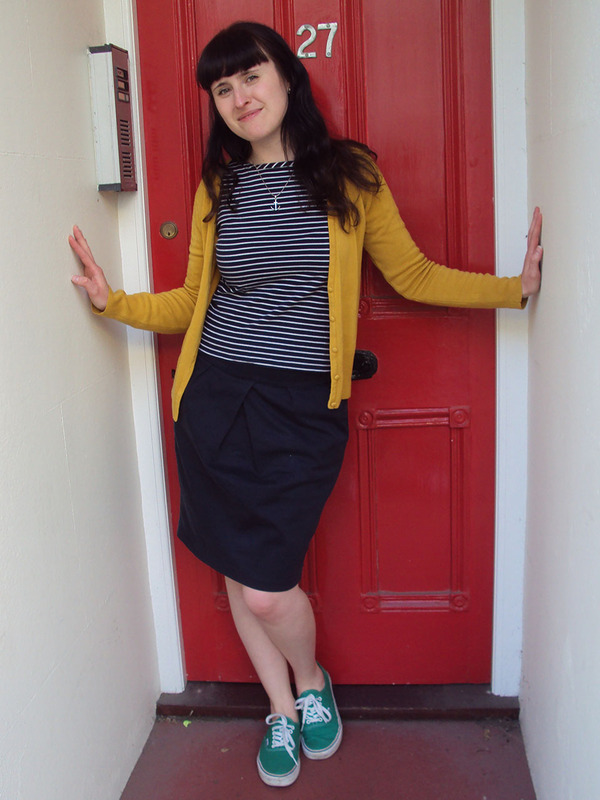 I also had to say 'My name is Zoe, I make clothes. 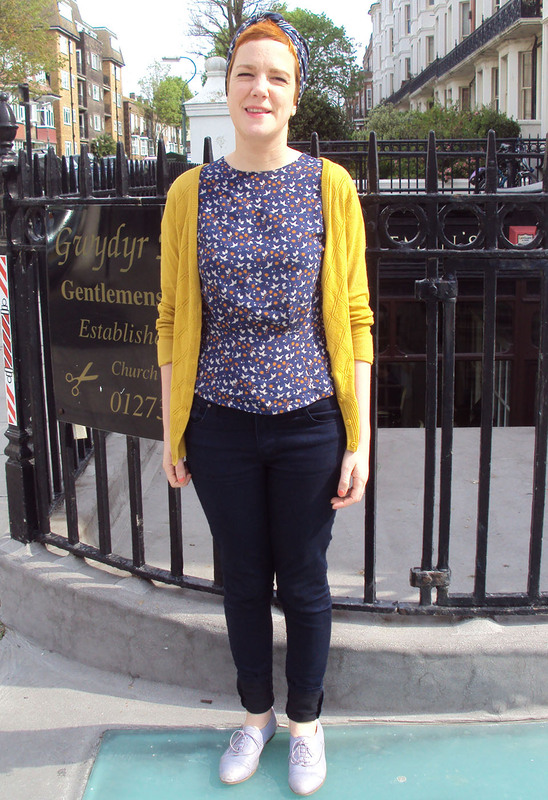 I am wearing a stripy T-shirt, a navy blue cardigan, a mustard cardigan and green shoes'. Fact. This blouse was initially made with my best mate in mind, but we've figured out that she has a long torso and this ended up being too cropped for her. 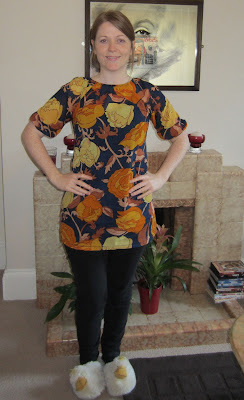 Although it's a tiny bit too tight for me, I love the fabric and enjoyed wearing it. Plus I cannot express how happy I am that it has become warm enough for me to wear my handmade shoes during this challenge! They rubbed a little, but did really well and I wore them almost all day. Woo hoo! More sandal wearing action. 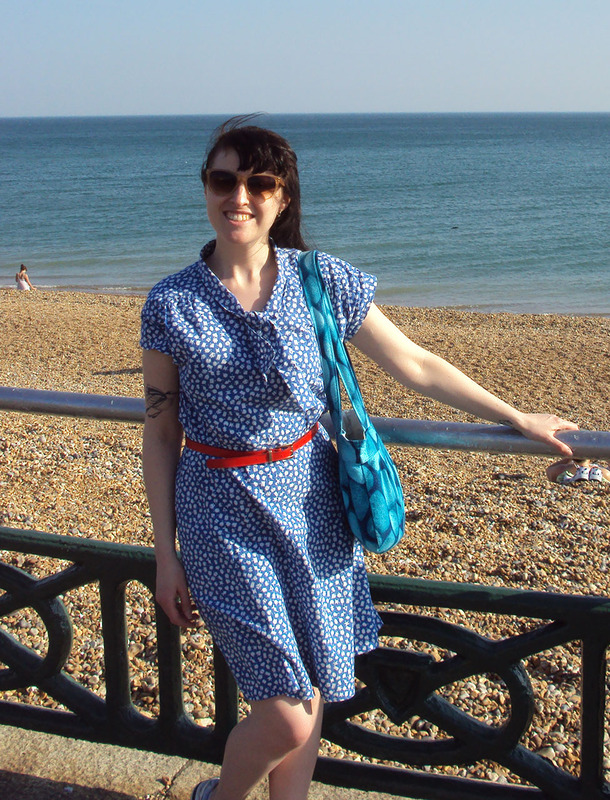 It was a bit too warm to actually need to wear a vest, but I wore one under this dress because the fabric is a bit itchy. 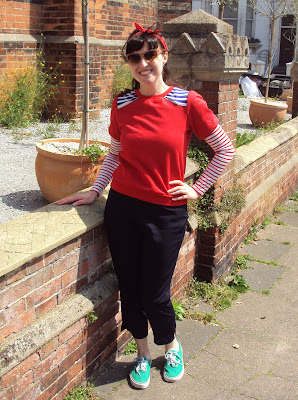 I know what you're thinking, 'Nautical' AND 'Diner' in one garment? Yes siree people, it can happen. 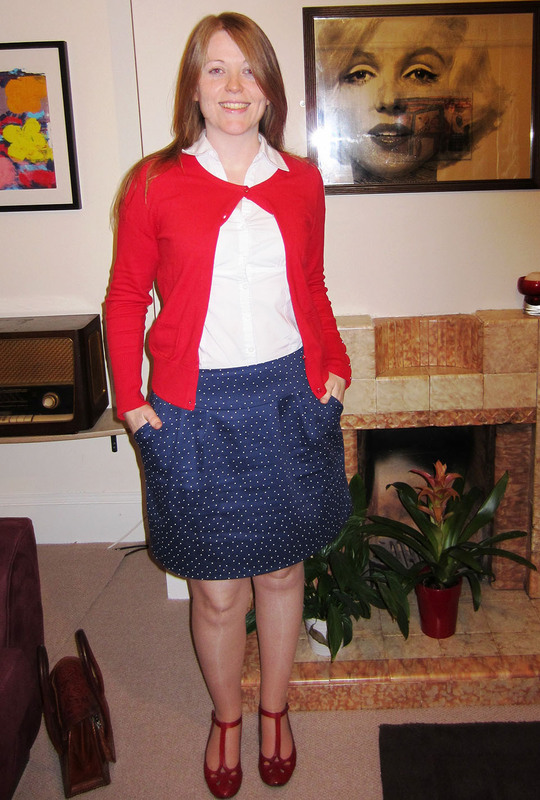 Not afraid to bust some nautical tones, my best mate Vic spent Day 15 in her navy sateen spotty skirt and accompanying red and white items. She would like it to be known that she has buttoned her cardi like this due to an unfortunate incident involving a can of diet coke. I think it looks ace buttoned that way. On Day 16 Mumma E was All Business. 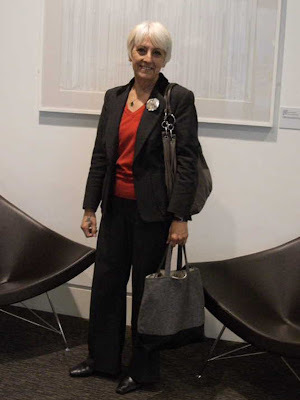 She was whizzing around London flitting here and there, seeing to her students and whatever else she had lined up, all the while making fine use of her grey wool and leather bag. Seeing as this bag, which I made for her for Christmas, has had some heavy use for about six months, it looks like it is wearing well. As long as it holds out until next Christmas, then I'll be pleased! 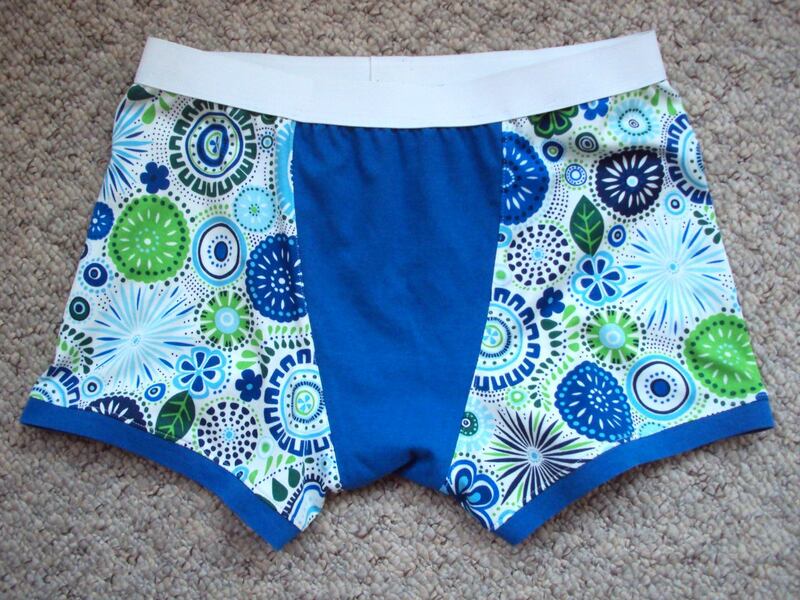 You have now already been introduced to Patty's second pair of fancy pants. I really love these pants, they are exactly the type I'd be looking for if I went shopping to get him some new undies. Apparently these are very comfortable, more so than the first pair whose elastic is needs replacing due to being too tight. 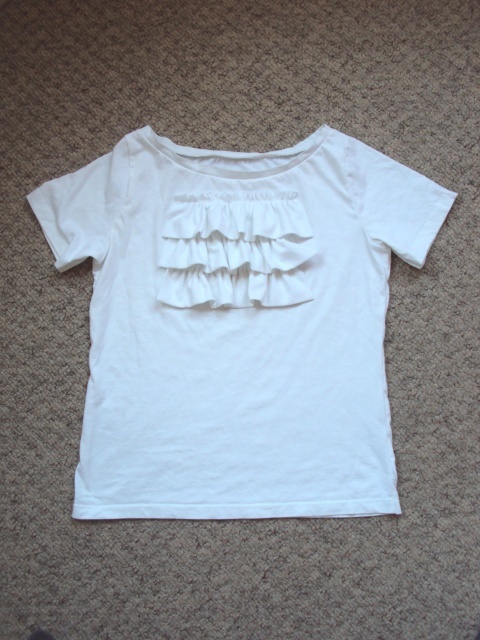 On Day 18, Ms Friday (AKA Harriet) wore her ruffle front remade white T-shirt. 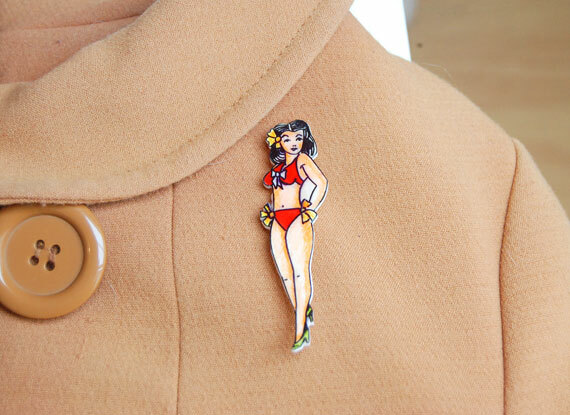 She informed me that she wore it with some high waisted jeans, which sounds a phenomenally strong look IMO! 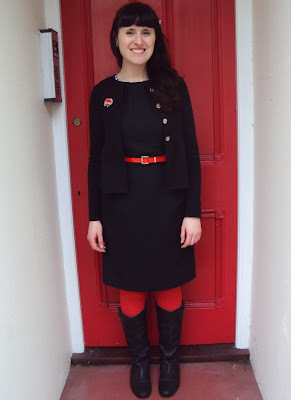 I love how the pieces I make my friends and loved ones get absorbed into the rest of their wardrobes, how they take the Zo-made things and match them with their other items to make outfits that reflect their own unique style of dress. To me, that is the highest of compliments they could pay my work. 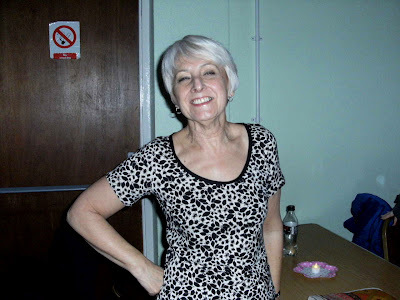 Unfortunately, due to a technical error I am only too familiar with myself, Vic's Saturday pic got deleted before it reached me, so this photo is actually from about three years ago! I remember because I'm pretty sure it was the from the trip she made to visit me when I live in Barcelona when I had just started going out with Pat. Anyways, it's this top, made from beautiful floral print chiffon which I decided was not for me almost as soon as I'd finished making it! Vic looks totally lovely in it. With Patty up in the North all weekend helping celebrate his dad's 60th birthday, it was up to him to remember his 'day' and to wear the Zo-made shirt I knew he'd packed. I wasn't able to go because I was teaching my 'Rework your Wardrobe' workshop in London on Saturday. But to his credit, when I texted him during the day to remind me, he was already wearing his shirt (the Rockabilly Bowling shirt) and had made sure he was photographed in it (see above, Patty with his folks and siblings). 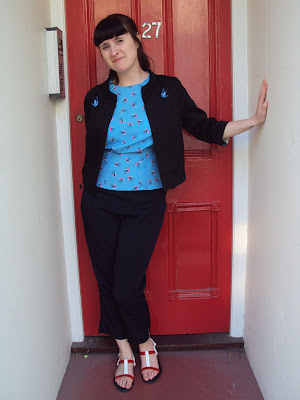 And last but not least for Week 3, Kirstin wore an awesome outfit which included a simplified Sencha blouse that has not previously been blogged about. This fabric is so great, I'm sorry you can't see it clearly. The print is tiny birds and branches. I made it for her birthday earlier this year, which ended up being very funny because EVERYONE who attended her sushi-based celebration gave her something with birds on it somewhere! I'm totally in love with her outfit in this picture. She has a great way of putting garments together. I've been really excited about writing today's post. There is pretty much nothing that excites me more than figuring out how to make a new type of garment, then doing so successfully. 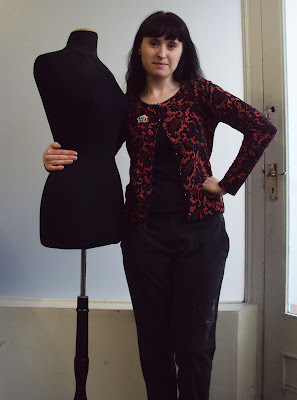 The idea being that, once I know how to make each type of garment, there is no need for me to buy one again, basically becoming self-sufficient in whatever that item is. This excitement is particularly heightened when it is a type of garment that the wearer relies on lots and lots during their everyday lives. 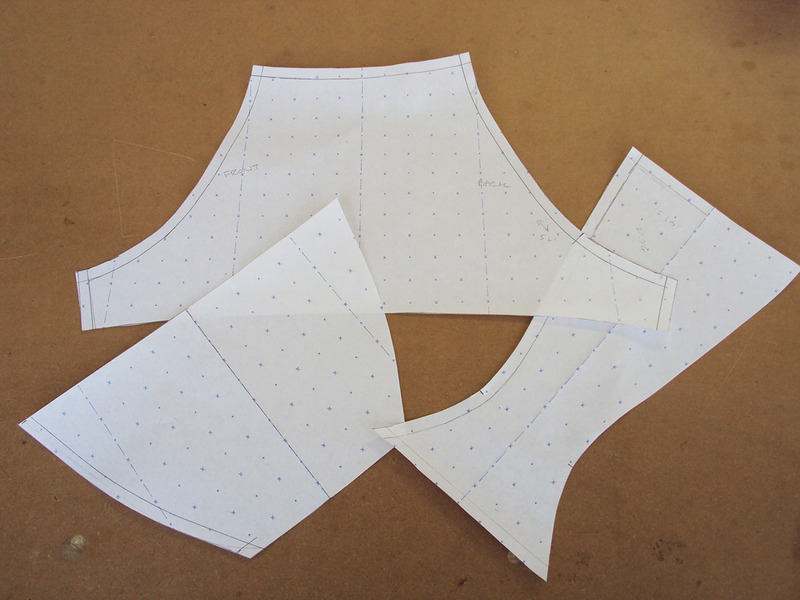 To figure out how to make a pair of undies, a vest (camisole, which I wear every day except for the vey warmest days) or pyjamas is way more exciting to me than making a pretty dress that will probably be worn a few times a year at most. it's probably how some people feel when they successfully grow carrots or make jam for the first time. 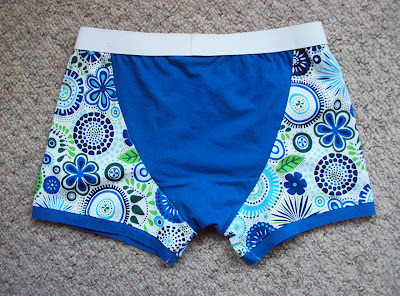 For a few months now I've been wanting to work out how to make undies for Patty (Mr So Zo) too. So I asked him which of his existing pants are his most comfortable (the tatty greying black pair pictured above). 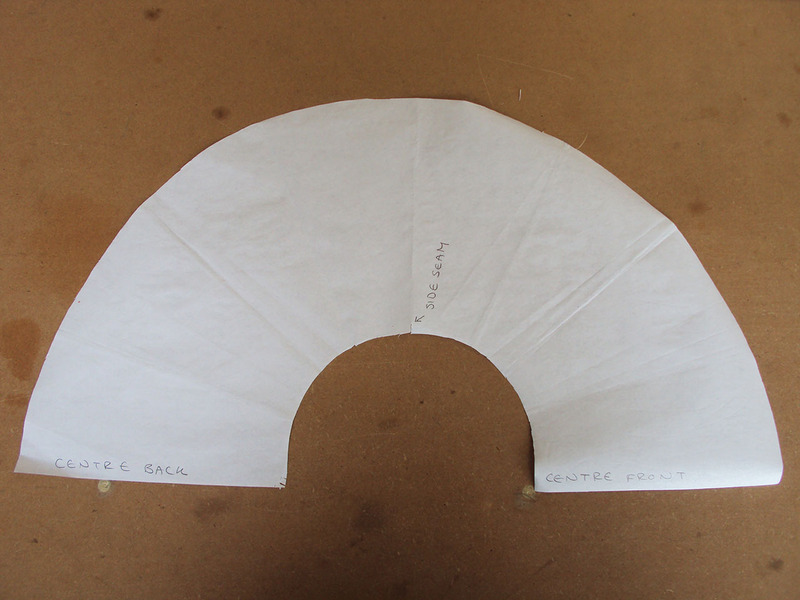 Initially I planned to do as I'd promised him: use my tracing wheel to draft pattern pieces from his undies, then return them unharmed. 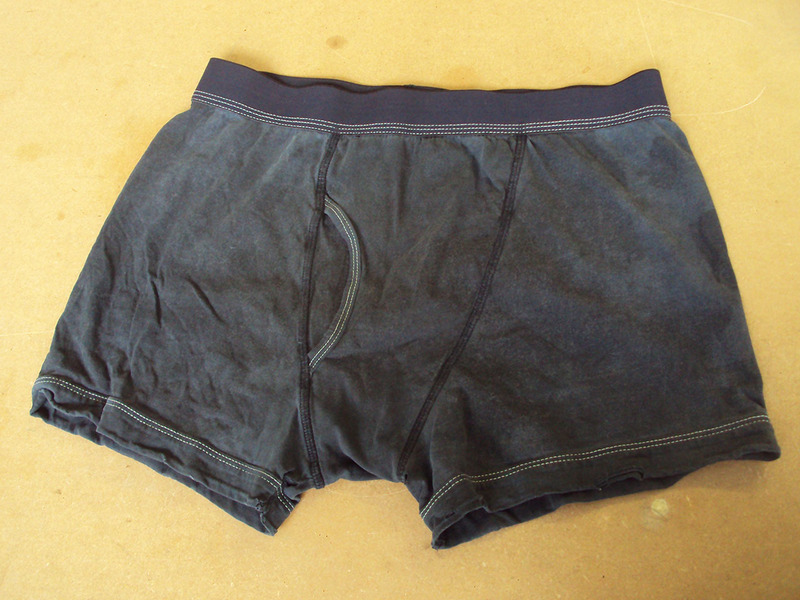 But when they came into closer scrutiny than doing the laundry usually requires, I realised they were pretty shoddy and on their last legs anyway (why do dudes find it so hard to cast off dead undies?!) so I cut them up and traced round the pieces instead. I think Pat was a little upset at what he considered their untimely demise, but I explained that they were sacrificed to spawn an infinite number of new pairs! 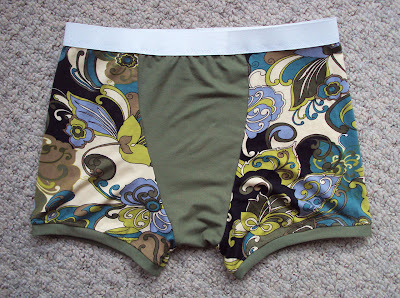 So with the pattern pieces created and seam allowanced added where necessary, it was time to select appropriate fabric. For the fist pair I chose some Liberty jersey, really nice and thick, and an unwanted blue T-shirt for some solid contrast. I harvested the bottom hem of the T-shirt to create bands to finish the legs of the undies and set to work with my trusted overlocker. I top-stitched the pants seam allowance down so they wouldn't stick out too much on the inside, but in hindsight I don't think that was necessary. All of the dudes pants I've come across (oh and there have been many! I JEST Mum, I jest!) 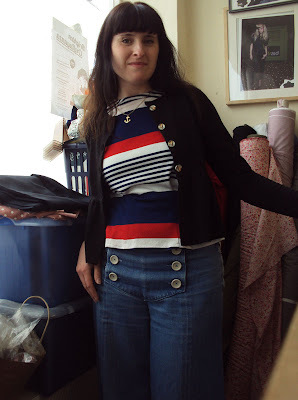 that are this style and made of jersey are constructed using a cover stitch machine or something, but I don't have access to any of that fancy machinery but I think I was able to create a really good effect with my overlocker and normal flat lock machine. 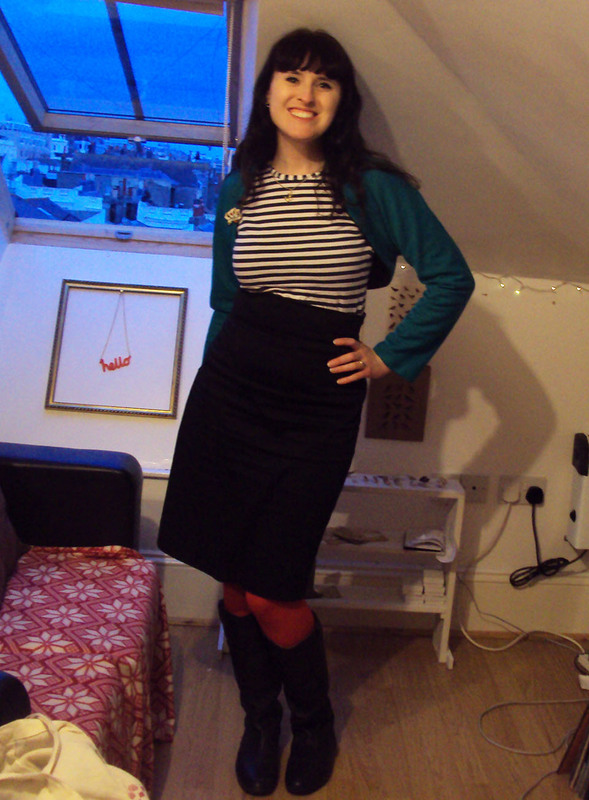 I picked up the elastic for the waist band when I went to the Walthamstow meet up in April. It was super cheap but decent quality and naturally a bit stiffer than the old stuff on the dead undies. It turned out to be a bit too tight, so I unpicked it and reattached it having extended the overall length from the generous overlap I initially added. After that adjustment, Patty was able to wear these comfortably ALL DAY on Sunday 13th. YAY!!!!! Success. Time for second pair. This time I added 2cms around the top to make them sit slightly higher on his waist. This pair also used some awesome Liberty jersey sourced from the stash at work, and some super soft contrast khaki jersey for the centre panels. 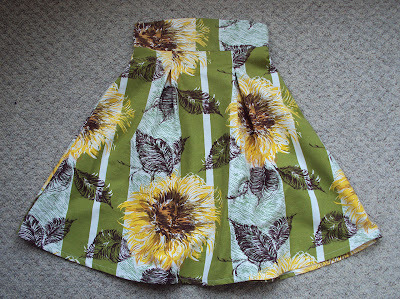 There are so many different print/plain combinations I want to create, now that I know the general fit is fine. These were also deemed a major success by Patty. Possibly the fanciest of pants he's ever had! You may have noticed that, aside from the vastly more exciting fabric choices and slightly different stitching, my versions are not the same as the original pair. Mine do not have the hole/access/slit/whatever-the-hell-you-call-it that the original pair had. I wanted to make sure I got a decent overall shape and comfortable fit before I started to monkey around with trying to add that element into the mix, which I'll probably try to make at some point in the future. However, I have been told they function fine without that hole, so maybe I won't rush to figure that out when I could be playing with fun fabric combos instead! But that none of this technical chat is really the point of this post though. The point is that I can make dude-pants. As long as I have access to jersey, thread, elastic and electricity to run my sewing machines, theoretically Pat needn't buy undies ever again! It can be argued, and I would probably be one of those doing the arguing, that this is a political act. Undies, for most peops, are something that is worn every single day of your life. To be able to extract yourself from the accepted role of consumer of this essential item is quite a powerful thing. 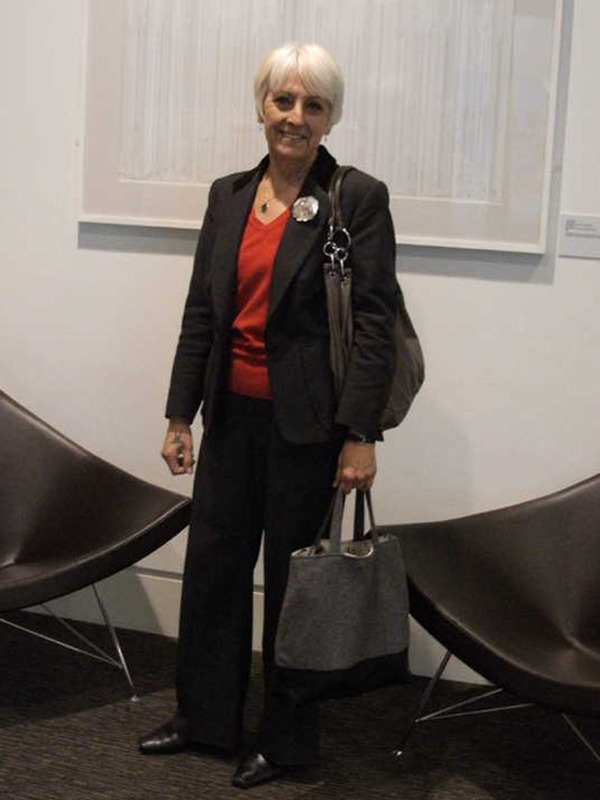 It is often argued in Feminist studies that 'the personal is political'. What is more personal than the most intimate of garments?! Chillaxing during MMMay'12 here! It's important to have a little rest during a hectic month such as this. Apologies for the rubbish photo. Patty has gone away so I must attempt my documentation photos solo. The problem I find both at home and at my work is that photo positions with decent light have lots of unavoidable mess in the background, but places with relatively clear backgrounds (like above) have terrible light. What to do? Saturday was such a long day. 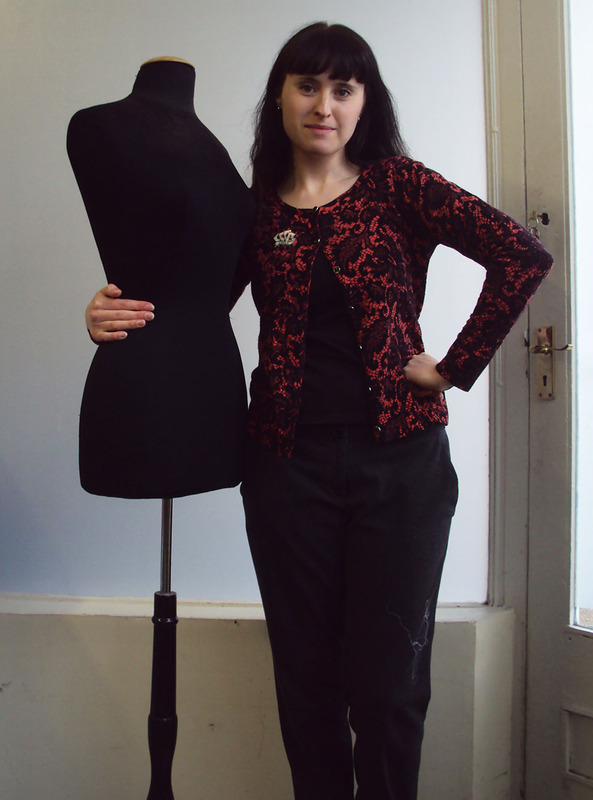 I taught a 'Rework your Wardrobe' workshop, had a lovely lunch with a friend, then met another friend in the evening. This outfit seemed to stand up to the whole thing admirably. Yay for me-mades! They really do function as well as any shop bought item. SUNSHINE!!!! Look, I've even got sunglasses on. Amazing. I love these trousers so much. I'll blog about them more fully hopefully next week, because the really do deserve their own post. I think I prefer them in this more casual outfit rather than the dressier one I was attempting on Day 12. Agh! When is it ever going to be properly warm?! I've been forced back into scarves and mittens even when I'm inside in the studio (thought to be fair the studio is as warm as the outside anyway). This cowl neck scarf wasn't made by me, but it was made using this tutorial. I'm not very impressed with this outfit. 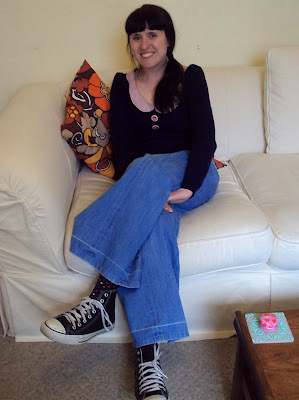 My focus was clearly on comfort rather than style when I got dressed that morning! Ahh, that's better. I like this outfit lots more. It's ticking all the boxes for comfort and style. 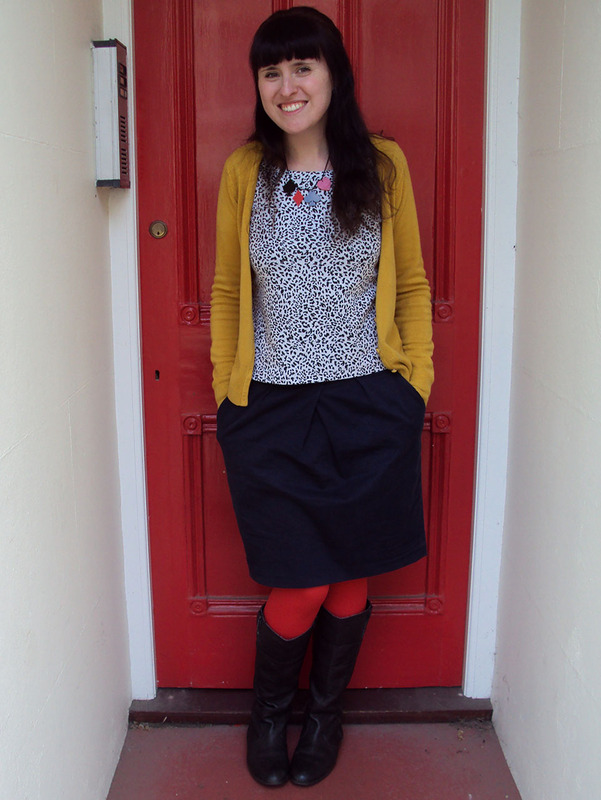 My smile would indicate that I am clearly warm and looking rocking! 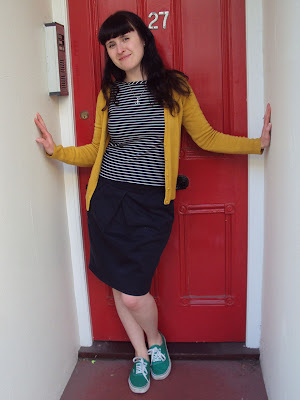 The readers of this blog with the keenest of eyes may have noticed a few garments popping up in various photos that I have yet to 'introduce'. Two of those anonymous garments are jersey tops with peplums. 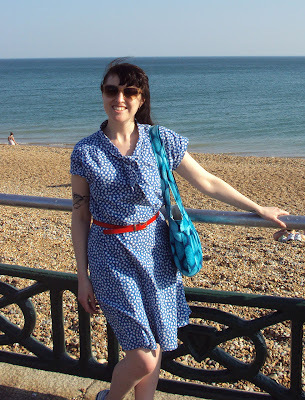 I wore the emerald one that is pictured above when I went to London to make shoes with Emily. 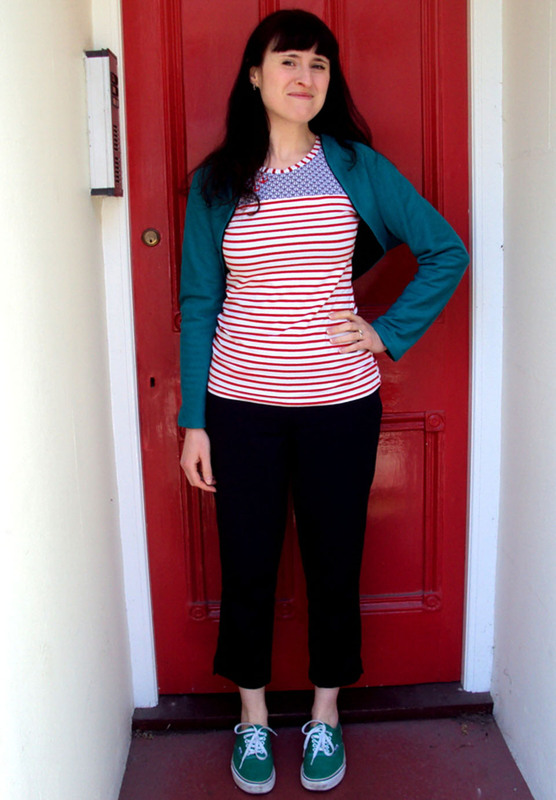 The second version was made in red and navy stripes (pictured below) and got its debut on Day 12 of MMMay'12 (during which I managed to clean the kitchen and get a bleach stain on the front but thankfully isn't too bad!). 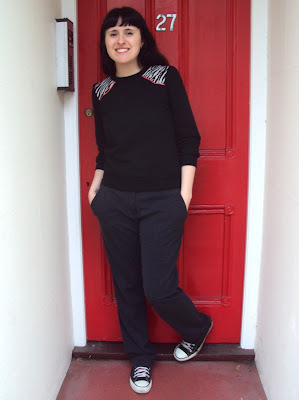 As the unveiling of my blouse sewing pattern hoard illustrated, I'm a big fan of peplums. 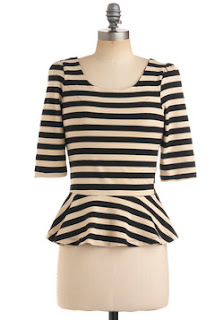 They also happen to be very 'on trend' at the moment, which is probably why Modcloth started selling some lovely simple peplum bodice tops, including the stripey one pictured below. 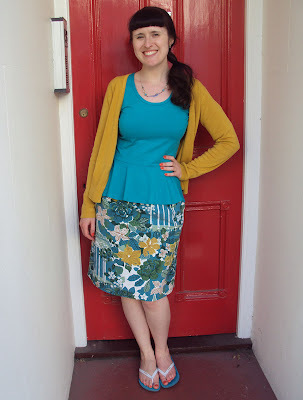 I'd been thinking about making my own version of these Modcloth peplum tops and started to get my head round how to go about it, when my boss came along and did the hard part for me. Having talked about how it would be great to get some peplums into our Spring/Summer range, she consulted her pattern cutting book and created a peplum pattern piece which was included in this and this design. So I used the peplum pattern piece, pairing it with my own modified self-drafted T-shirt patterns to come up with the gathered head half sleeve, scoop neck version using the awesome emerald jersey I got from the most recent Brighton fabric swap meet up. The colour of that fabric really is far more rich and emerald than the turquoise my camera would have you believe in the top photo. 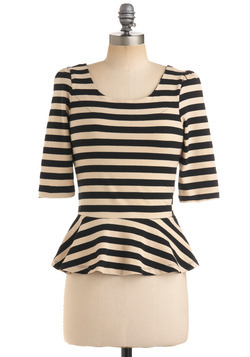 I really love that top, but my heart had really been captured by the stripes of the Modcloth top pictured above. 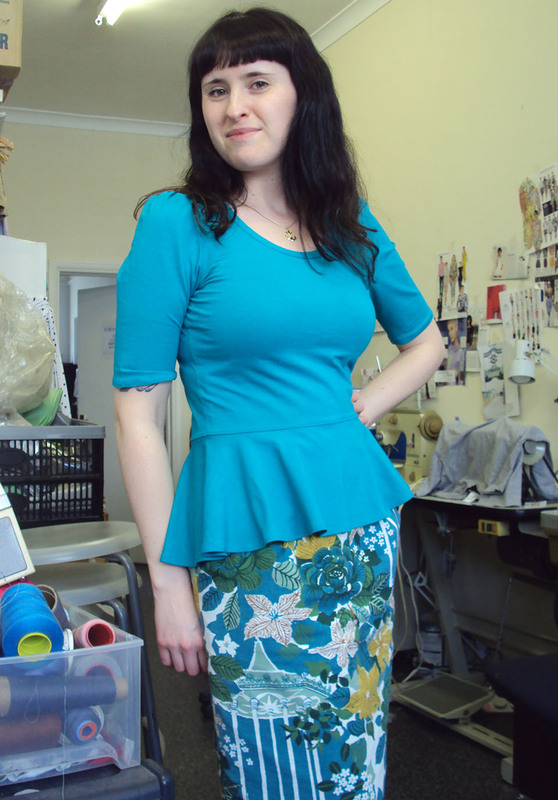 The way they change direction, really emphasising the way the peplum is cut, looks so cool that I knew I had to make a second peplum top. But due to my whole 'not buying new fabric' thing, I had to wait until some suitable stripy fabric came my way. The navy and red jersey was part of a large haul our charity was donated by a jersey manufacturer. Because I'd just made a gathered head half sleeve, scoop neck version, I decided to alter those elements to create a differently styled garment. My navy and red striped garment has flat head sleeves that are 3/4 in length with a cuff band to finish them. 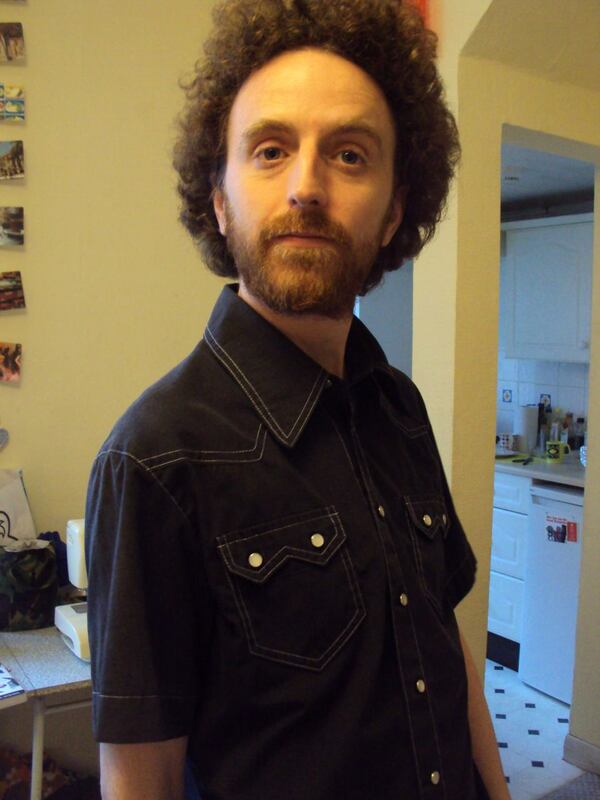 I've also gone for a self-bound slash neck line to get with the more nautical feel of it. Both the neck binding and cuff bands play with the direction of the stripes. 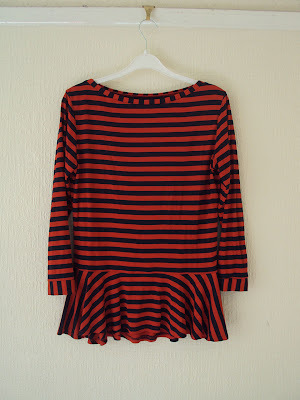 So now you are properly introduced to my two new peplum tops. I can't promise there won't be more in my future!!! 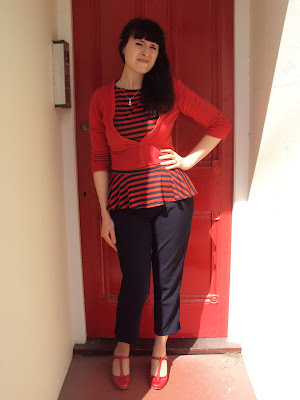 Have you made anything with a peplum? Are you a fan of this trend? ** UPDATE** For the lovely commenters who expressed interest in how these peplum tops were created and what the peplum pattern piece looks like, please see below. You may or may not be able to see that the measurement of the Centre Back is a bit longer than the measurement of the Centre Front. The CF and CB should both be aligned to the fold of the fabric. 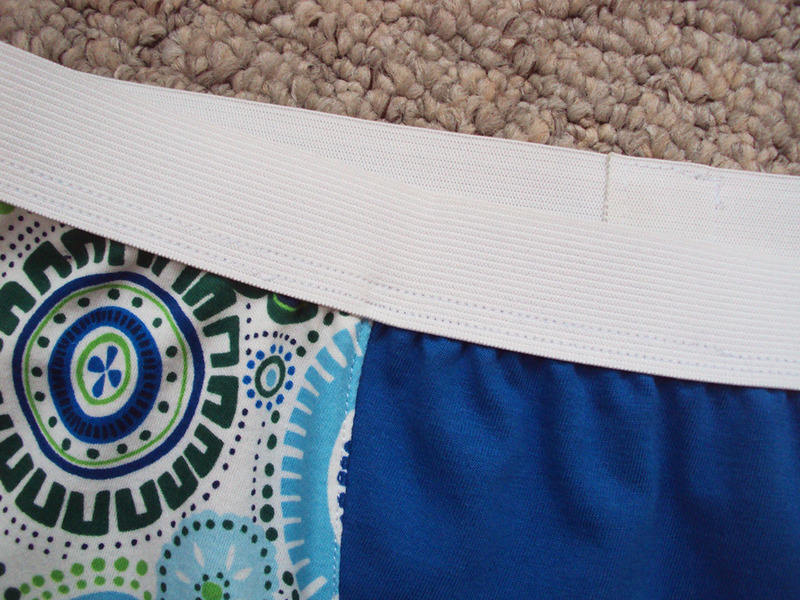 Create notches at the CF, CB and side seams to make the construction easier. Please let me know if you have any more questions and I'll try to help if I can by putting the answers up here. 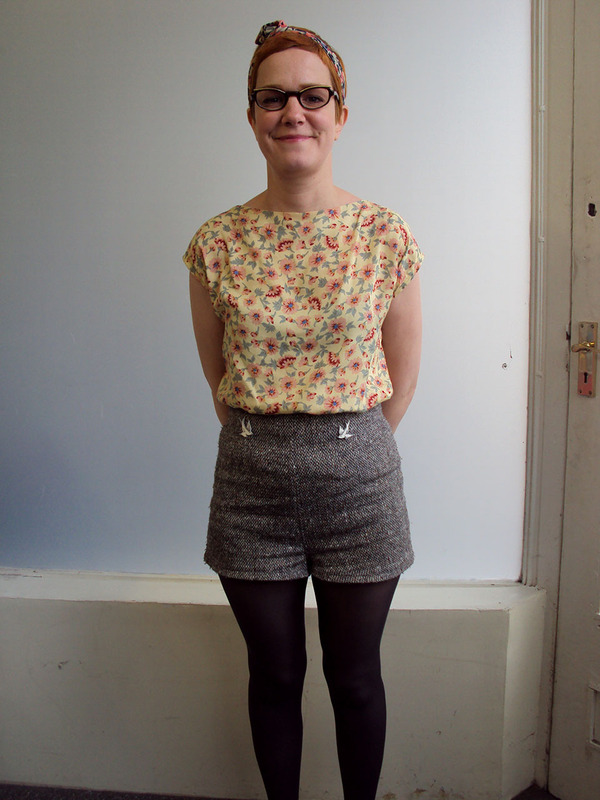 On Tuesday my best mate Vic rocked a sheer floral tunic that I actually made for myself two years ago. 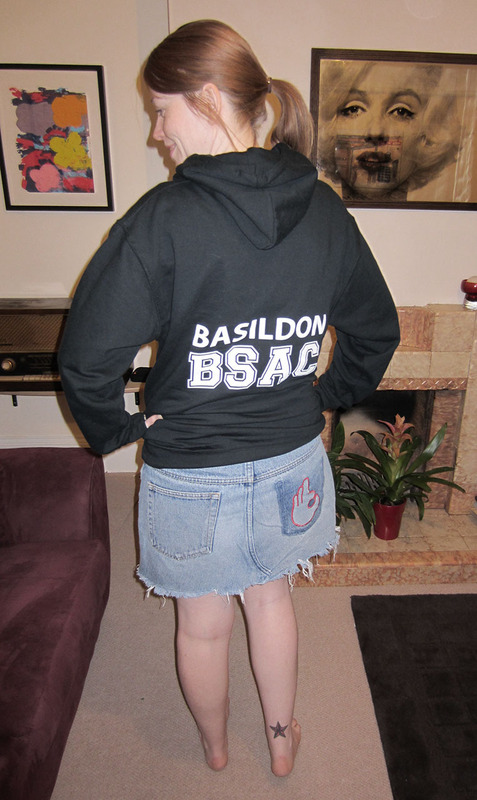 Upon realising that my arse has out grown said tunic, I knew Vic would look great in it so gave it to her. I think she has proved me correct. Ha! 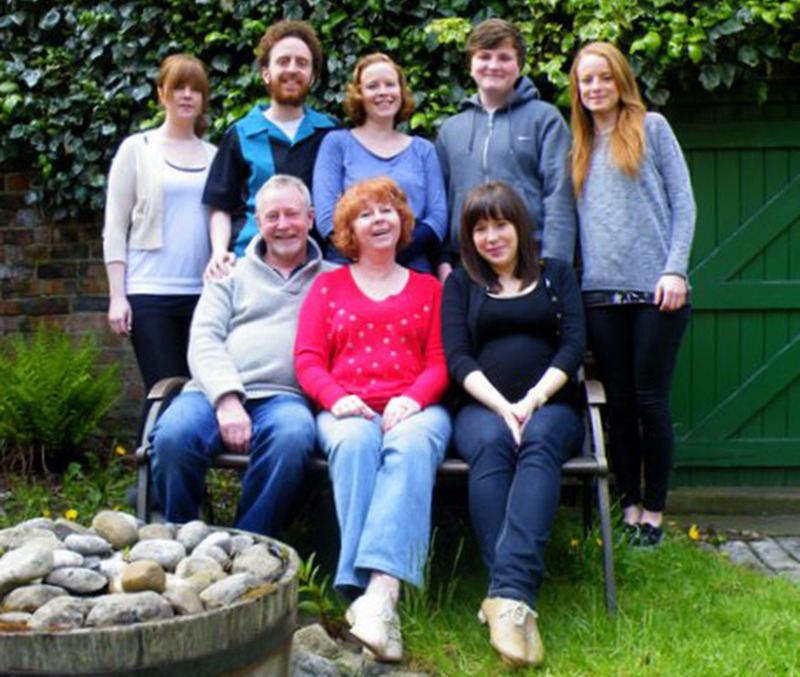 Look at Mumma E loving the camera! She wore a scoop neck T-shirt I made her as an experiment just before we went on holiday together to Venice in January. You can't really see it but the print on the jersey is leaves and insects. It was an experiment because it was the first stretchy garment I have made her and without having her close by (Mumma E lives in Essex, holler!) it was a real guess. Being considerably tinier than me, the proportions and dimensions were difficult to judge, but aside from needing to be taken in a bit at the waist, it was an overall success. Plus Venice was FREEZING when we went, so she was thankful for an extra layer of clothing! On Thursday Patty wore his Brokeback balcony shirt, the first I ever made him, and the most complex garment I have ever made for anyone other than myself! This shirt, now over two years old, has faded a fair bit but is still going strong. The topstitching still looks ace and it was long enough ago for me to forget all the swearing that accompanied stitching it all! 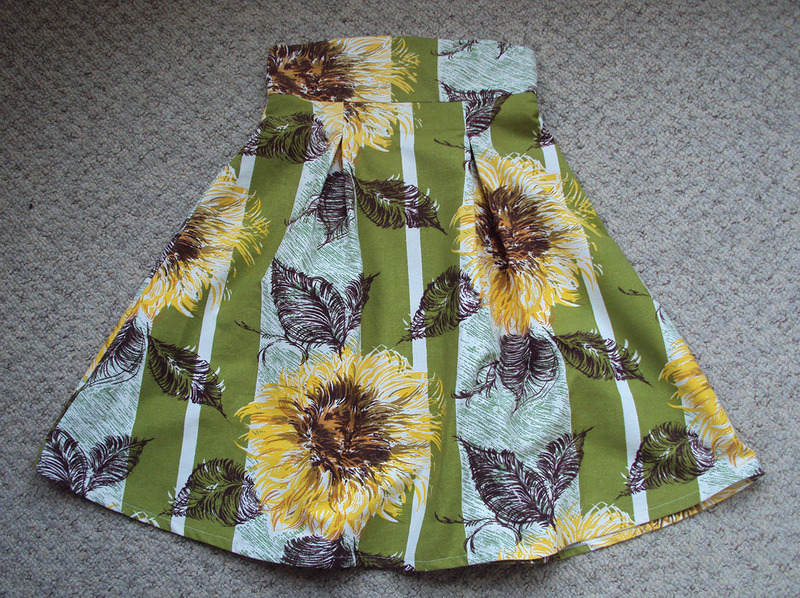 Friday's garment is a sneak preview of a Poetry & Clothing project garment that I have yet to blog about. I'll go into it further when that post eventually materialises. I was pleased to hear that Harriet had been getting some use from this as, being pretty loud, it was a bit of a wild card creation for someone else. Ok, Sunday was quite a special day for MMMay'12 round these parts. Not only did Patty wear TWO Zo-made garments, but one of them was a brand new type of garment altogether!!!!! 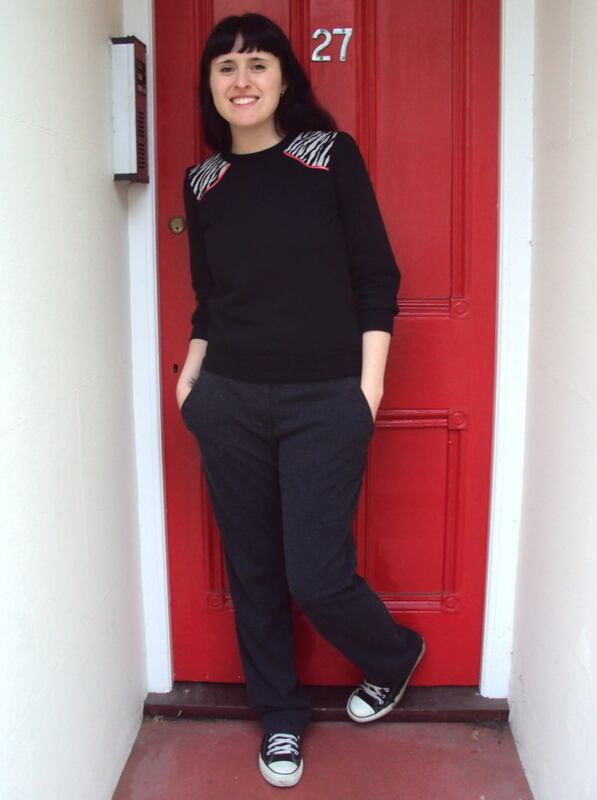 I'll blog about this in full later this week, but in short: I've figured out how to make dude-pants! Now is not the time to fully express just how exciting and life-changing this new endeavour is for me, but let me tell you that they performed their task well and were worn for the whole day. Patty also wore his Book Launch shirt, which I wasn't expecting him to do because I thought the pants might be enough to concentrate on, but he wore the shirt as well voluntarily. 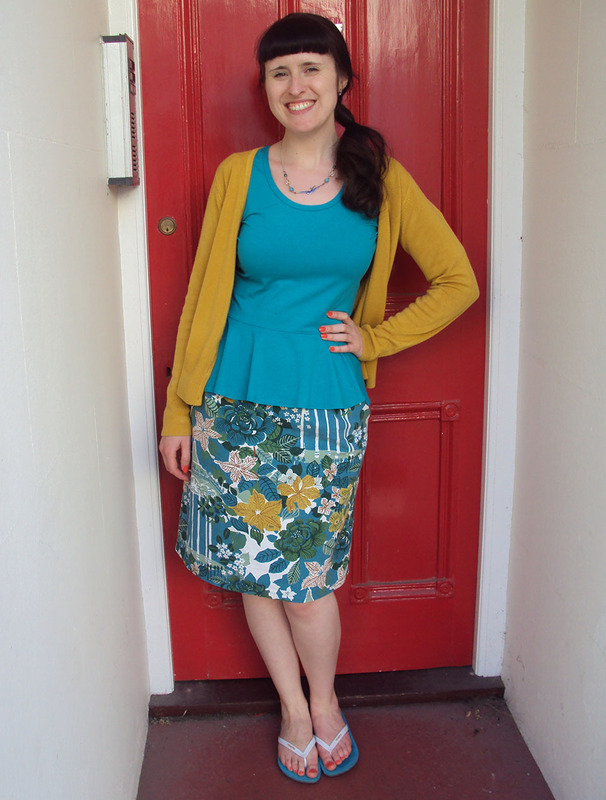 Ms Monday (AKA Kirstin) spent today in a fabulous collaborative handmade ensemble. 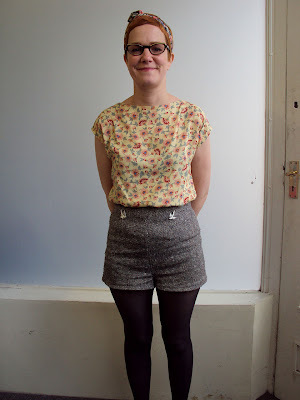 The Zo-made element is the tweedy shorts I made her for Christmas but she is also wearing a beautiful blouse made by her lovely friend Amy and a cute pair of swallow brooches made by Kirstin herself. So there you have it. 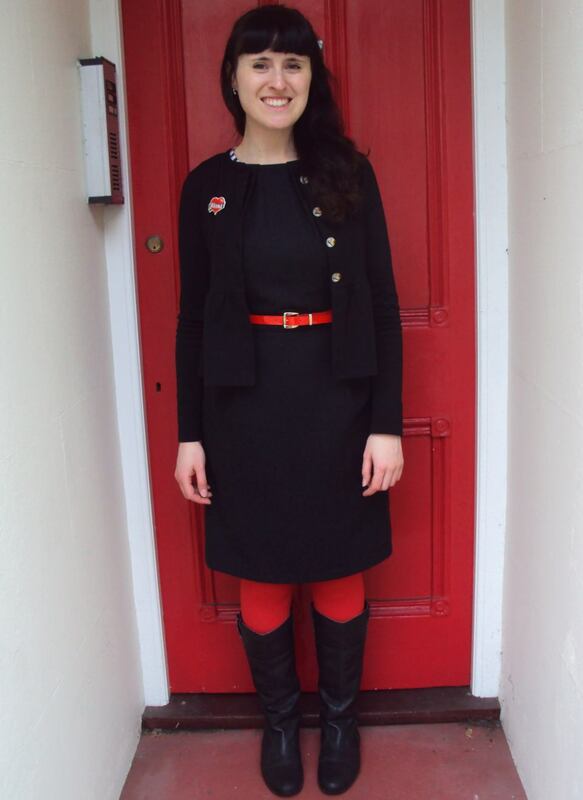 Another week of other peops wearing Zo-mades! Aside from hanging out on the flickr group and seeing how the other participants are getting on, this is totally my favourite part of the Me-Made-May '12 challenge for me. COMFY outfit! I really can't explain how nice these trousers feel to wear. I often panic thinking that I've left the house wearing my jam-jams, but then I look down and remind myself it's just the School Boy trousers working their magic. In June I'll blog a couple of recent sweatshirt refashions/remakes, including this one. Now, this outfit is fine and all and pretty cosy on a chilly day, but I'm just not that impressed with it. It feels really boring and just not 'me'. 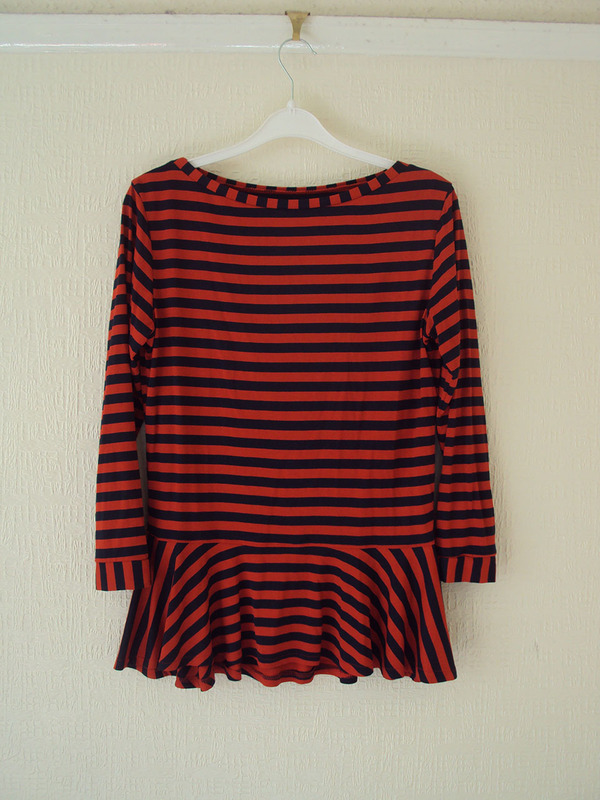 I have to work out a way to wear this dress that makes me feel more reflective of how I want to dress. Many apologies for the terrible photo. 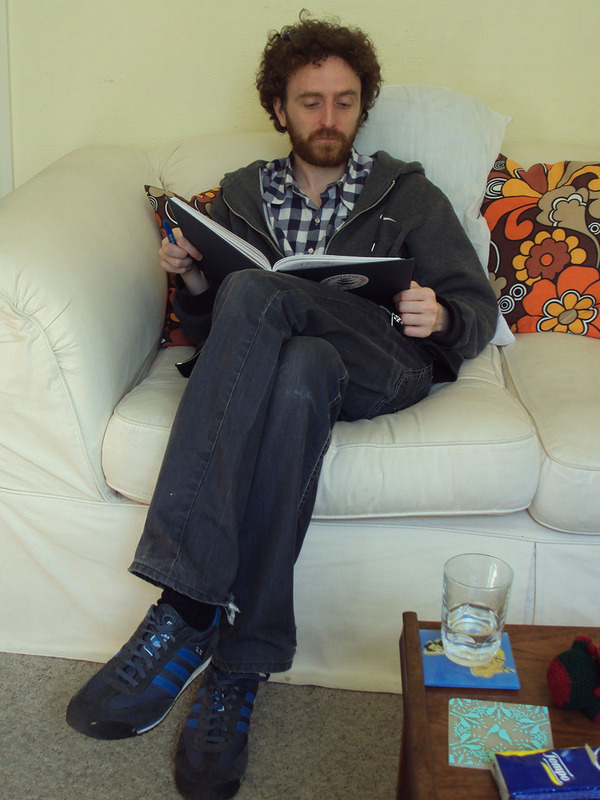 See what happens when Pat goes to Tai Chi and leaves me to take my own documentation photo? 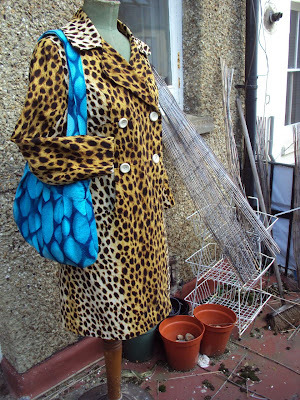 From Day 11 onwards, basically I have decided it should be warm enough to ditch my navy wool coat in favour of my lighter leopard coat. In case you were wondering why the ugly photo background, I must explain that in the MMMay'12 flickr group we have a photo challenge each Friday to try and incorporate into our day's documentation photo. This Friday's challenge was 'Ugly backgrounds', so some of us tried to find some shoddy locations for our documentation. This is our horrible little backyard which hasn't been cleared up since a rubbish Winter of wind and rain. As you can see, the sun came out and my vitamin D deprived body can't handle it! 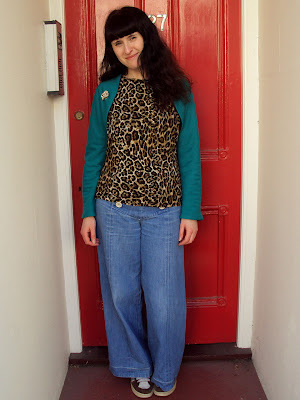 Day 12 saw TWO brand new and previously unblogged garments. God, I know how to live! I'll blog about them soon. Of course I then immediately went and cleaned the kitchen and got a bleach mark on the top!